If missing teeth have you feeling like you’re missing out on certain things like smiling with confidence, talking with ease, and eating your favorite foods, we can help! At Arizona Biltmore Dentistry, we provide start-to-finish dental implant care to help you get a full, and fully functioning, smile once again. Dental implants are preferred by dentists and patients alike for replacing missing teeth, so come in for a consultation to learn how they can benefit your smile. Dental implants can be used to replace any number of missing teeth. They are strong and secure, so they allow you to get back to doing all the things you could previously with a full set of teeth. The implant — a small titanium post that we surgically place into your jawbone. The abutment — a connector piece that allows us to place a restoration on top of the implant. The restoration — a crown, bridge, or denture that we design to fit on top of your implant(s) to complete your smile. At Arizona Biltmore Dentistry, we provide computer-guided implant surgery using our state-of-the-art technology, including 3D cone beam scanning. This allows us to virtually plan your procedure with precision to eliminate guesswork, increase safety, and deliver more effective results. The entire implant process takes place over multiple appointments. We start by taking images to check the health of your jawbone as well as to confirm the proper position of the implant. We place the implant(s) during an appointment and then give the implant time to heal over the course of a few months. During this time, the titanium of the implant fuses with your jawbone, giving us a solid foundation for placing your restoration. Once fused, the implant essentially functions as a replacement tooth root. After healing, we’ll bring you back in to place the abutment and restoration. The type of restoration we use depends on your needs and dental health. 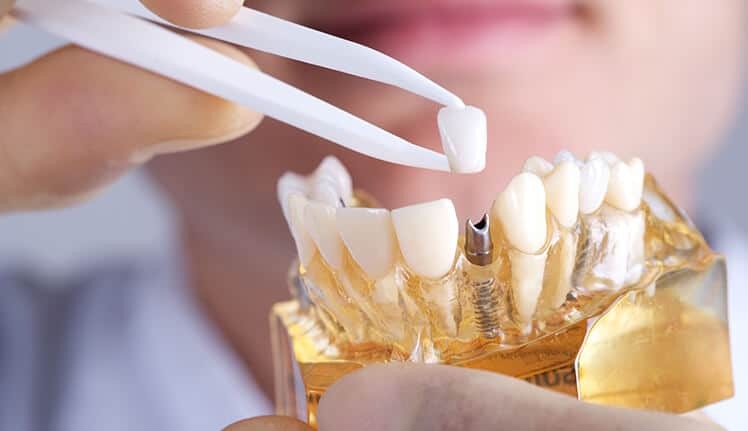 We often use a crown or bridge for single-tooth implants, a bridge for patients missing a couple of teeth in a row, and a denture if most or all teeth in an arch are missing. Do you wear dentures that slip or click, or are generally uncomfortable? Dental implants can help stabilize your denture while also eliminating the need for messy denture adhesives. 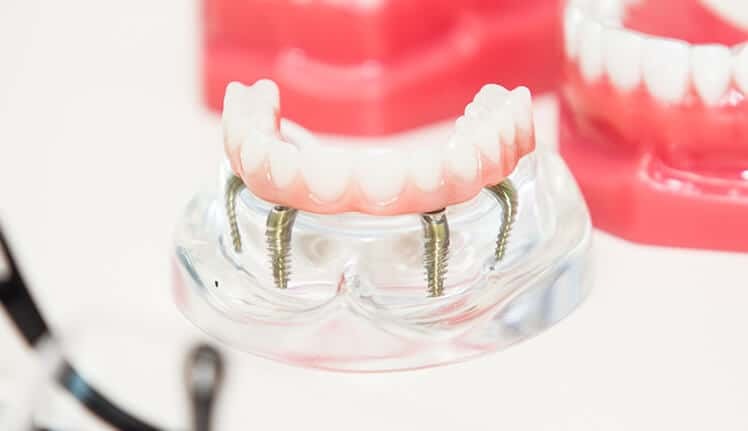 In order to stabilize your dentures, we will strategically place four to six implants in your jawbone and top the implants with a connecting joint. We will either create a new denture for you with holes that line up with your implants, or we can drill holes into your existing denture. When you want to wear your denture, just line up the holes with the implants and snap it into place. Using implants to stabilize dentures helps stop the slipping and clicking, making it more comfortable than ever before to wear dentures. Also known as Teeth in a Day, All-On-4 dentures fit exactly how they sound – on four dental implants. We can use this procedure on either your upper or lower jaw. During your implant consultation, we’ll go over your needs and goals for your smile, along with your lifestyle, and help you determine if All-On-4 dentures are right for you. Experience the difference at Arizona Biltmore Dentistry! Schedule a visit to our office today.